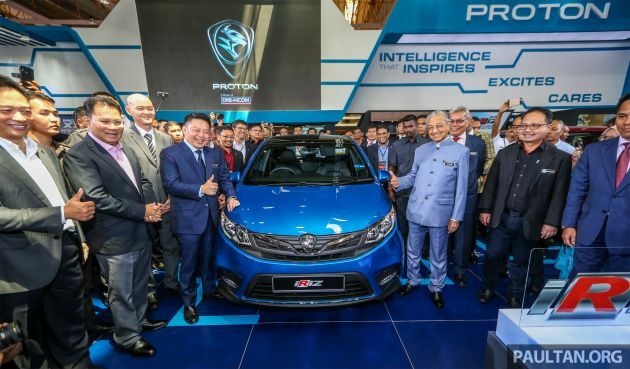 The 2019 Proton Iriz and Persona facelifts made their public debuts at the Malaysia Autoshow yesterday, unveiled by prime minister Tun Dr Mahathir Mohamad. The show is happening at MAEPS Serdang till this Sunday. If you’ve “seen them before”, it’s because the refreshed Iriz and Persona were revealed to the media in February and March respectively. The B-segment models – which are open for booking – have also been shown to selected customers at weekend events at selected Proton dealerships. We’ve already detailed the facelifted duo, but here’s a recap. The Iriz face is now dominated by an “Ethereal Bow” grille highlighted in chrome, which leads into the top of the headlamps and “cups” the Proton logo. Look closely and you’ll find the “Infinite Weave” pattern that debut on the X70 SUV. There’s also a new bumper with LED DRLs nestled within the side intakes. The hatchback’s rear is obviously changed, thanks to the thick black bridge between the vertical lights. That gloss black strip houses a Proton script logo as seen on the X70. There’s also a new bumper and a new Iriz model logo highlighting the ‘R’ in the name. Inside, the 2019 Iriz gets an all-black theme, new fabric seat pattern, new instrument panel (with full-colour multi-info display), perforated leather on the steering and steering voice control button. The latter is for the new seven-inch head unit with “Hi Proton” voice commands for navigation, music and weather, among other things. There’s internet connectivity via a built-in eSIM. The top Premium CVT variant adds on a X70-style gear lever and a frameless rear view mirror. This latest facelift pulls the Iriz and Persona further apart in terms of looks. If the hatchback attempts to look sportier, the Persona tries to look classy. The sedan’s face also sports the “Ethereal Bow” design, but that chrome element carries the whole grille, as opposed to just the logo on the Iriz. That results in the “Infinite Weave” pattern having more prominence. The original car’s big lower grille has been slimmed down, while the air intakes flanking it (now with LED DRLs) have been made larger; a slim gloss black strip ties it all together. At the back, there’s a revised rear bumper with a chrome strip, plus a new rear bootlid garnish with the Proton script logo. Like the Iris, there are new rims. Inside, the sedan keeps its black and beige colour scheme but gains a frameless rear-view mirror, new part-leather upholstery and a gearknob from the X70 (with a leather boot). New features include automatic headlights and an auto up/down driver’s side window (previously only auto down), and a new instrument cluster as per the Iriz. Also present is the above-mentioned new infotainment system, which has 16 GB internal memory and mirroring for Android phones. The powertrains remain unchanged – both come with a 1.6 litre VVT engine with 107 hp at 5,750 rpm and 150 Nm of torque at 4,000 rpm, paired to either a five-speed manual or a CVT automatic. The Iriz has a 1.3L option with 94 hp and 120 Nm at 4,000 rpm. Proton says that the CVT has been recalibrated to reduce fuel consumption by around 3-4%, and changes have also been made to achieve improved braking performance and refinement. According to carmaker, 367 improvements were implemented for the Iriz, while for the Persona, 303 improvements have been made to various parts. “Proton is very thankful to the honourable prime minister, Tun Dr Mahathir Mohamad, for graciously unveiling the 2019 Proton Iriz and Persona. Our engineers and designers have worked very hard over the past 18 months to improve both cars and we are confident Malaysian car buyers will see and experience the benefit of their efforts the moment they step inside each car,” said Proton CEO Li Chunrong, who added that to date, 8,000 bookings have been collected for the two models. Check out full specs and galleries of each Iriz and Persona variant and watch our walk-around videos to learn more about the cars. 110,000 cars VS 397 cars. I think rakyat has spoken which car is the better car. The Nautica launch till end production only sales 289 units. I think rakyat not crazy with car brand or logo, now rakyat more brilliant to choose which car are more value added. FYI, Perodua always suitable those housewife and young lady daily usage. I think 110k owners are from housewife and young lady. Proton sales have remain stagnant the past few months. Where are they gonna get money to pay their workers? 8500 x RM 10k = RM 85 million, enough pay their workers. Tahniah! With over 25k bookings plus 8k delivered X70s, P1 is soaring back to the top. Didn’t you kept repeating Proton sales only can get 3000 per month? Now there is 8000 bookings what say now b055kurr? Why do you quote your other dupes? No balls to admit is that it? Hidup Proton Baru! Hidupp Tun!! 8,000 bookings?!??! That’s more than Proton’s monthly sales figure. Proton should release a complete list of the “300++ improved parts” they claim to have in the updated Iriz and Persona respectively. Partly because of curiosity and partly just to make sure they know what they’re talking about. Tak habis habis dengan ethereal bow dan infinite weave. Kalau mcm tu, tanya la juga BMW kenapa tak habis2 dgn kidney grill dan Hoffmeister kink. Tanya juga kenapa semua Nissan GTR take habis2 dgn 4 lampu belakang bulat. Itu semua (termasuk ethereal bow, infinite weave) dipanggil styling signature. “Ethereal” means “extremely delicate and light in a way that seems not to be of this world” but honestly Proton so-called ethereal bow is nowhere near that beautiful especially the one on Persona which doesn’t flow well with other lines on the car. It’s more square-ish rather than “ethereally” blend in. Proton has to do much better than this before it can be compared with BMW kidney grill, Kia tiger nose, or Mazda design signatures. And then, what’s with this Geely trick of launching cars without announcing the price? Same like X70 case previously. They want to wait and see public reaction first and then decide how much margin to slaughter the consumer with. If Malaysian buyers are smart they should all unite and abstain from booking early so that Proton will price the car cheaper to attract more bookings. is Madani working for Proton now? He is your kind, no? Its becoz of him P1 wasnt allowed to fly higher. Otherwise we wud have better P1 cars without the need to sapot his para kroni. Thanks to booting him out, now Geely can work to bring P1 back to the glory days without his interference. The ‘glory days’ Proton had was also under Tun M’s guidance wasn’t it john? Correction, I made a mistake. The glory days was when Japanese cars were priced skyhigh. Now it is lower, Proton are naturally facing more competition. It’s prior success has nothing to do with Tun M. My bad. With Geely backing, I am confident Proton will be successful once more even with the fierce competition. Listen here. You’re not the only Darren in this world. I still stand by what I said. I don’t see any problem with john speaking the truth. tak ada orang tq BOSSKU… he is the 1 move to this stage and try to make Proton great again. Looking at the meter, feel like driving a BMW. I bet the main factor which contribute to sales is the ‘Hi Proton’ capability. I think owners would appreciate the improved refinement too. Still the CAMPRO single VTI is a put off!! Test drive dulu baru cakap. 8000 waiting customers disagrees with you. Come on, stop doing all these half-assed releases. The Saga with new auto gearbox will be coming out soon, should have released these facelifts with the Hyundai auto transmission replacing the lousy Punch CVT instead. Refresh the Preve and Suprima with Hyundai PowerTech 6-speed autos so that the CFE engines can be unleashed to their design potential of 160hp and 250Nm of torque, with more reliability and better shifting feel. Just vomited after looking at those two. Proton and their usual de-volution. Pathetic. Luckyly, Perofua saves the day as Malaysian maker. Berapa kali mau tipulah. Cakap ada booking 8000 unit. Lepas 3 hingga 6 bulan atas jalan raya nak nampak 1 buah pun susah. 8000 books… That’s an impressive number. I’m curious as to know what the breakdown is. I also think that in the interest of cost-saving, say in 3 years, when it comes time to replace the Persona and Saga (both launched in 2016); Proton may want to consider merging both into a single model, that perhaps has 2 or more different engine options, and a price that ranges from RM35k to about 55k.